Upgrading to an automatic pool cover will make it easier to protect your pool from storm debris, keep kids out, and warm the pool water on chilly days. As you prepare for the warm long days of summer, you are undoubtedly dreaming of all the upgrades that you can give your pool. An automatic pool cover is a fantastic upgrade that offers you additional value, convenience, and peace of mind. Here are some of the many reasons that our customers love automatic pool covers. 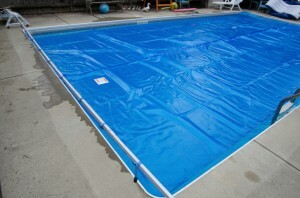 Automatic pool covers are ideal for homeowners with children or pets. By having a properly-installed cover on your pool, you will take major steps towards preventing child-drowning incidents and any accidents. Automatic pool covers are even endorsed by the US Consumer Product Safety Commission for the amount of protection they add to pools. If you don’t already have a cover and have kids on the way (or grandkids on the way! ), it’s not too late to add them now. Automatic pool covers can also decrease the amount of energy that you use in your pool. They decrease the amount of evaporation that will occur when you aren’t using the pool and consequently decrease the amount of energy you need to use to keep the pool a good temperature. If you live in a state where drought is a potential concern, reducing the amount of evaporation is also critical to not going over your water usage or losing tons of water in the summer sun. Traditional pool covers can be a hassle to put on and off, so homeowners skip using them throughout the season. Automatic pool covers make it easy to decide to take a dip, uncover the pool, and cover it back up again once you are done. Taking a quick swim has never been easier! This entry was posted on Friday, February 24th, 2017 at 9:10 am. Both comments and pings are currently closed.